Inspired by Asian culture, the uniquely designed rooms come with handcrafted furnishings and air conditioning. A cable/satellite TV and minibar are standard features. Bathrooms have hot-water showers and a hairdryer. Muang Kulaypan Hotel is less than 5 minutes' walk from Chaweng Town. It is a convenient 10-minute drive from Samui Airport. Guests can borrow DVD, books and magazines at the hotel's stylish library. Island day trips and golf games can be arranged at the tour desk. Budsaba Restaurant offers fresh seafood dishes and Thai delights in Thai-style huts. Refreshing drinks and snacks are available at Panyee Pool Bar. The hotel offers free wireless access in all areas and 3 food and beverage options. The Kala is a 20-minute drive from Koh Samui Airport. A chargeable shuttle service to Lamai and Chaweng Beaches is offered while the hotel's private beach is just a short stroll away. Rooms at The Kala Samui have private balconies and modern bathrooms. They are fitted with a DVD player, flat-screen television and mini-bar. The Kala Samui offers water sports like snorkelling, kayaking and private fishing. Guests can also soak in the infinity pool or relax at the hotel's library. The 26 Degrees restaurant offers fusion meals while the Lobby Lounge serves light snacks as well as beverages. The Rabbit Bar is another good spot to relax and enjoy drinks with friends and family. The luxurious resort features beachfront accommodation, an infinity swimming pool and free Wi-Fi. The spacious rooms at Boutique Baan Haad Ngam Resort come with modern décor. Each elegant room is well-equipped with a flat-screen TV, a DVD player and a refrigerator. A spa bath and hot shower facilities are also available in all rooms. Satira Herbal Spa features all-natural massages and beauty treatments. The resort offers car rental services and free parking. Daytrips and travel arrangements can be made at the tour desk. Olivio Restaurant serves a selection of award-winning Italian, Thai and international dishes. The Cocktail Bar offers refreshing drinks and light snacks. Baan Haad Ngam Resort is 5 km from the Fisherman's Village and a 10-minute drive from Samui Airport. Just steps from beautiful Choeng Mon Beach, Imperial Boat House Beach Resort features 2 outdoor pools and a variety of dining options. The air-conditioned rooms include a balcony. Complimentary round-trip transfer to Chaweng is provided. Created from authentic teak rice barges, the 34 luxury suites at The Imperial Boat House Resort welcome guests with a unique design and warm atmosphere. Premier and Poolside rooms are located in low-rise buildings set among the resort’s gardens and pools. All rooms and suites feature a private terrace with garden or pool view. When not enjoying the beach or pools, guests can unwind with a massage or body treatment at the Imperial Spa. Those feeling more active can go canoeing or windsurfing. Scuba-diving lessons are offered. Guests tired out by a day in the sun can visit the games room for relaxed entertainment. 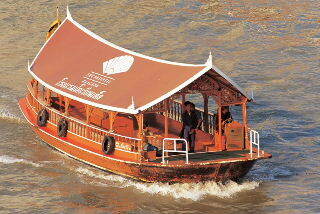 The Boat House Restaurant is open for all meals and serves Thai and international dishes. Captain’s Choice offers seafood and fine dining. Manao Bar and Pool Bar serve refreshments all afternoon and evening. A breakfast buffet is available at the open-air Sala Thai. The Imperial Boat House is located only 4 km from the Koh Samui International Airport. It is 7 km from Chaweng Beach and 4 km from Koh Samui’s Big Buddha. Thailand has three seasons: rainy from July to October, cool and dry from November to February, and hot from March to June . With picking seasons spanning all three seasons of the year, Thailand has more than three dozen kinds of attractive fruit that come in a collage of shapes, a spectrum of colours, and a melange of flavours. Flowers and plants blossom in profusion and display a myriad of colours to delight the eyes and refresh the spirit all year round. The country divides into four regions - North, Northeast, Central and South - sharing borders with Malaysia on the south, Burma on the west, Lao on northeast and east, and Kampucha on the east.